Latest colourways to come out of the dyepan. These are three separate pieces of tops, making a full range of colour between them. And I'm so pleased with them I think I'll keep them in sets and see how they sell. This is a rather gorgeously soft Wensleydale, from Devon rather than Yorkshire, and it's taken the colours quite brilliant. This is white BFL - pure brilliant colour. And oatmeal BFL - rich, muted colours. Hard to imagine this comes out of the same dyepan as the other two. These will be priced at £33 for each 300g set. They won't be going up on Etsy, as I'm planning to take them to the remaining shows. Unless someone gives me a shout beforehand, in which case I'll have to dye some more! Which I can, of course. Just a few photos that someone was organised enough to take the other Saturday, 6th August. I was teaching my 'Woollen and Worsted' workshop, which seemed to go extremely well. During this workshop I explain the difference between the two types of spinning, the yarns they produce, and the type of fibre-preparation that are used for each. 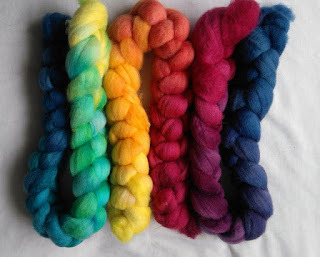 And then, of course, there is the whole spectrum of yarns/spinning from one extreme to the other. It's a really useful exploration of different spinning techniques, and even experienced spinners find it useful. It would be an excellent workshop for a new spinner to take, once they were confident with their wheel. We used tops in Shetland, Wensleydale, Masham, Merino, and Shetland roving, as well as some fleece for a quick demonstration of both combing and carding. In this workshop there isn't the time to spend on hand-carding that I like to do in my purely woollen-spinning workshop, which is why we used roving, and also spinning from the fold. Nope, I rarely wear anything on my feet when teaching. And it was baking hot that day. Mark and the pupz delivered me to the village hall in Orton Waterville, then went a mile up the road to Ferry Park, where they found lots of open ground, and lake with giant swan pedalos (which blew Lunil's mind) and a miniature railway. More than one trip was had on the latter; I wish Mark had taken photos. And we picked up potatoes, onions, and mangos (the latter probably not local) from a layby seller on the way back to the A1. (We know the A1 very well at the moment, having gone up and down it last weekend, to FibreEast). 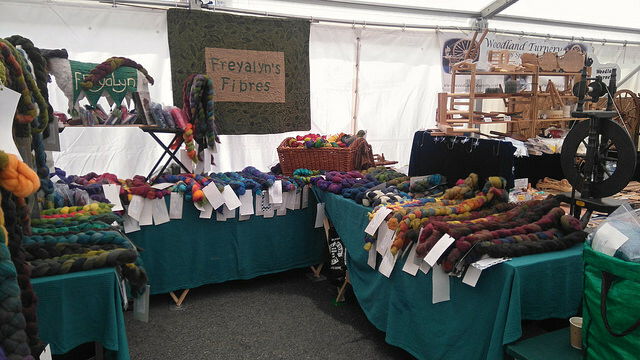 We had a lovely weekend for Fibre East this year - no rain, despite the promise of a shower or two, sunny but not baking, and a breeze to lighten it up a little on the Sunday. And this was the first big show with my new look presentation. I've dyed my table covers, left the shelves at home and used two flat-pack chairs and a plank for Gladys The Sheep, and Mark spent a while putting hooks and rails on a wood and paper three-panel screen I've had for ages and ages. The bags I've always kept my fibre in were starting to look a little sad, and I'd noticed that sometimes the material it was made of would dull the colours. 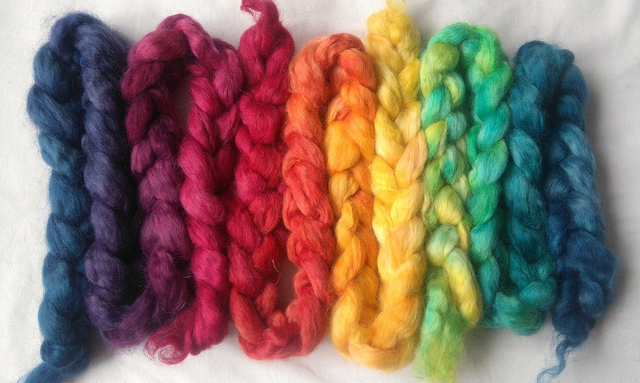 And the whole point of my hand-dyed fibre is the COLOURS, so not being able to see them rather defeated the purpose. Now, all I have to do is see if the braids end up looking a bit 'handled' at the end of the season. Mind you, I think a lot of the wear and fuzzing that braids get is due to storage, and we also invested in some new storage from Ikea (what would wool shows do without Ikea?? ), which are boxes rather than bags, so once the fibre's packed away between shows it shouldn't move at all. I also have a few one-off sockyarns as well as my usual BFL, BFL/nylon, and merino. I had a huge run on my bags of scoured and dyed fleece, which I had thought would last me the rest of the season, so I had to have a panic run to the Sheep Sanctuary tent on Saturday afternoon to see what fleeces they still had. 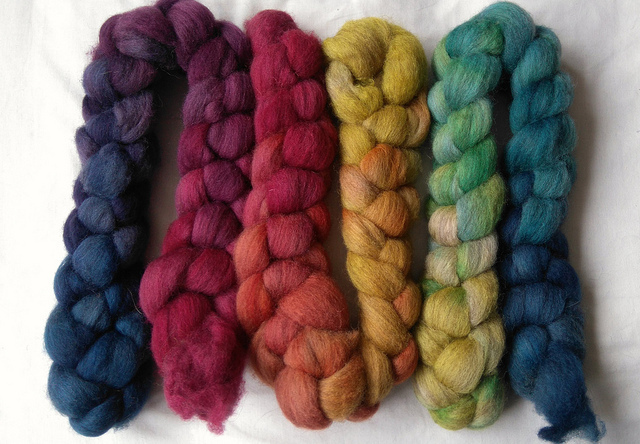 I picked up three: a Lleyn, a Suffolk cross, and a surprisingly lovely tan-faced Mule that I managed to get washed and dyed this week. All to be done in the next few weeks. I have a few new colours this year, Foxglove (which I'm really pleased with, as I've nailed the colours of this year's amazing foxglove display) and Selkie (the blues and greens of water, the browns and greys of seal fur). 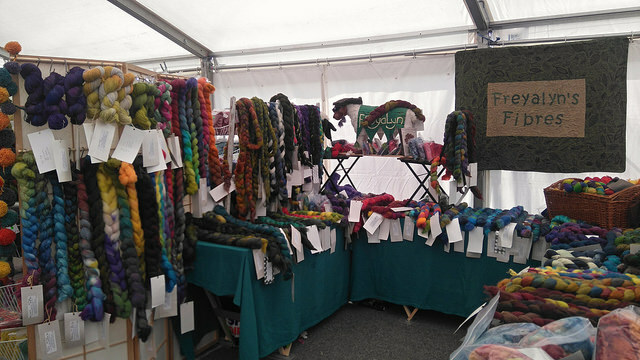 I could do with time at home to have a good sort out and start some more dyeing, but I'm teaching my 'Woollen and Worsted' workshop at Peterborough Guild of WSD tomorrow (note to self, make sure we know where we're going) and visiting Nunnington Hall on Sunday to pick up fleeces.